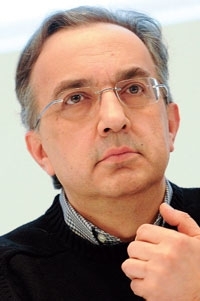 Chrysler CEO Sergio Marchionne says compact cars based on a Fiat platform could be here by the fourth quarter of 2011. DETROIT -- Chrysler Group is accelerating the timetable to fill a major gap in its lineup: compact cars. CEO Sergio Marchionne said last week that compact cars based on a Fiat platform could appear in North America as early as the fourth quarter of 2011. Company officials had said Chrysler and Dodge compact sedans would arrive in 2012. The Fiat-based cars would compete with such cars as the Ford Focus, Honda Civic and Toyota Corolla. "We've run extensive clinics on the first vehicles. We're 98 percent there on styling," Marchionne said. Chrysler has three compact-sized vehicles, none of them sedans: the Jeep Compass and Patriot crossovers and the Dodge Caliber hatchback. Before 2011, Chrysler plans to address another weakness: mid-sized sedans. Marchionne said the company will deliver significantly reworked versions of its Chrysler Sebring and Dodge Avenger sedans in the fourth quarter. "We have carried out significant surgery on the architecture of those cars and made significant improvements of the interiors," Marchionne said. Marchionne also told analysts last week that Chrysler was moving closer to an initial public offering, based on the company's surprise $143 million first-quarter operating profit.